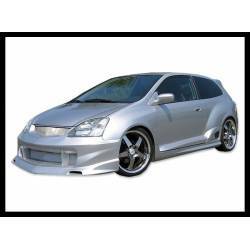 Body Kit Styling for Honda Civic 2001 - 2006. Wide body parts catalogue online for Civic 01 - 06. You could buy front bumpers, rear bumpers, spoilers, side skirts, hoods, diffusers and more. You can also buy a full body kit for your Civic 01 - 06. If you don’t get yours, contact us and we will do it. Compatible parts made on glass fiber, carbon fiber or ABS. Customize your BRAND if your car needs some improvement, and give to your car a personal and new style.